​SAN ANTONIO – Boeing's operations on the city's Southwest Side are expected to grow significantly with the potential to double its local workforce to meet demand for aircraft services provided by Boeing Global Services. 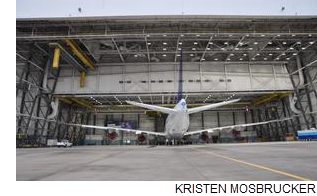 Boeing’s 168-acre site at Port San Antonio has about 1.6 million sf of building and aircraft hangar space, and sits near Joint Base San Antonio Lackland Air Force Base; in recent years the facilities have been underutilized. In the past year, Boeing designated the site as one of 300 Global Services locations across the world in the past year, to conduct maintenance and repair for defense contracts and commercial airline businesses.